Allow for new beginning in how you view and speak to yourself. Set the intention for yourself and for the Planet so outrageously that you almost laugh at their implausibility!! The human mind is the most miraculous instrument in existence, it’s like Kalpavriksha “Sacred Wishing Tree“ what ever you ask for becomes a reality. Once you organize your thoughts, emotions & energies in one direction, your ability to create and manifest is Phenomenal! Through dance, a whole science and art of Kundalini Yoga &Meditation, extended Gong & an art of creation on your personal vision-wishing card for the New You! 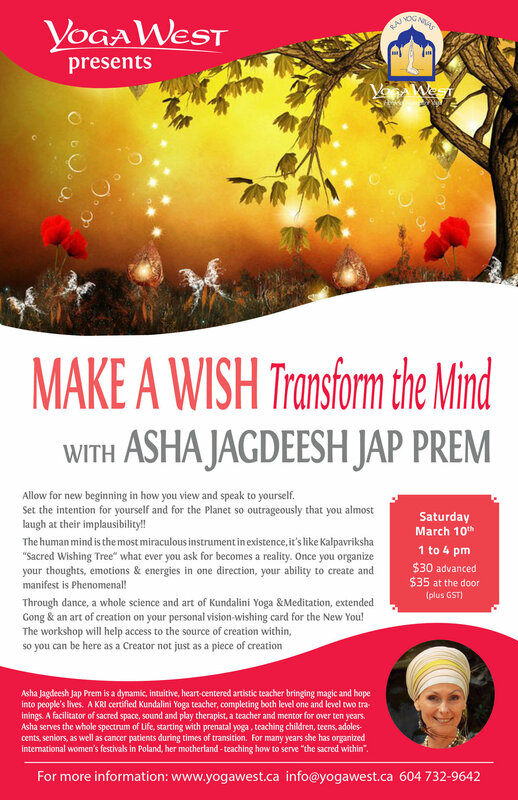 Asha Jagdeesh Jap Prem is a dynamic, intuitive, heart-centered artistic teacher bringing magic and hope into people’s lives. A KRI certified Kundalini Yoga teacher, completing both level one and level two trainings. A facilitator of sacred space, sound and play therapist, a teacher and mentor for over ten years. Asha serves the whole spectrum of Life, starting with prenatal yoga , teaching children, teens, adolescents, seniors, as well as cancer patients during times of transition. For many years she has organized international women’s festivals in Poland, her motherland - teaching how to serve “the sacred within”.